February's Six O'clock Swill is Fringe-tastic! The Swill is back for its second Fringe Festival with three terrific plays. Amy and Anya are pissed; Cindy Dillingham got voted Prom Queen. And Ron Bobby has been unfaithful. What to do, what to do. Oh, what's that on your prom dress Amy? 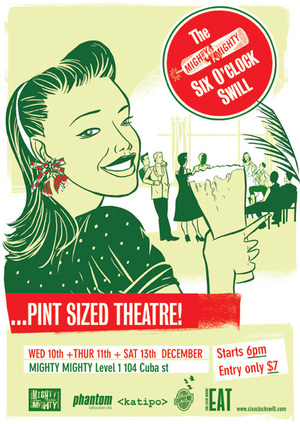 December 2008 Six O'clock Swill - an Invitation to Love? 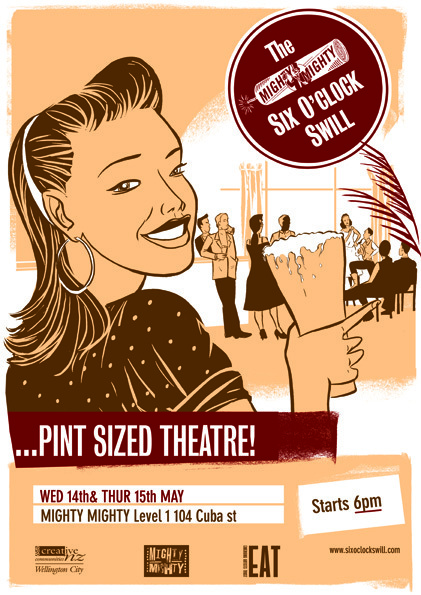 The Six O'clock Swill is an exciting seasonal series of plays held at The Mighty Mighty, where two new one act plays are presented for your entertainment - all for the bargain price of $7. Before his expiration date, a deadbeat ex-hippie sent a memo to his former wives inviting them to his funeral, and two of the women on the rather long list happen to meet at the open-coffin viewing. Let the dirt fly! After a very successful series as part of the New Zealand Fringe Festival in February, the Swill returns this month with more hilarious, quirky action at the Mighty Mighty. Wed 12 & Thu 13 March, 6pm Mighty Mighty.